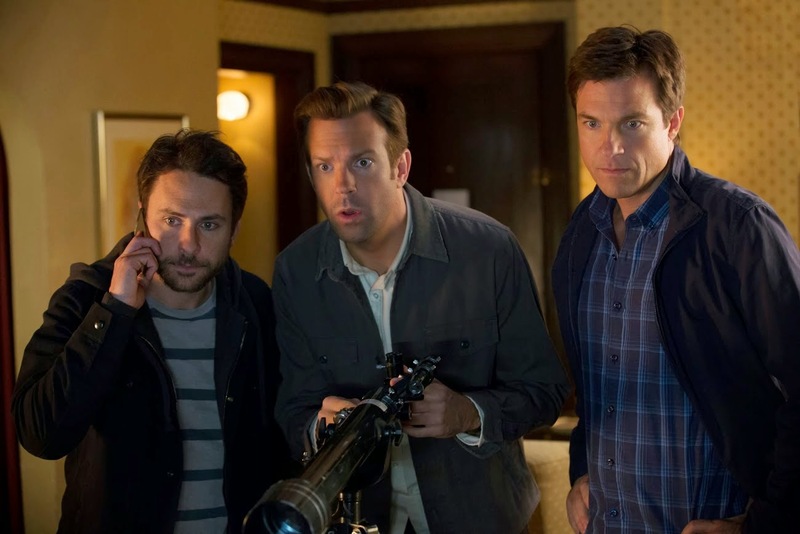 Everything you need to know about Horrible Bosses 2 is in the hysterical opening scene. Nick, Kurt and Dale have overcome the difficulties they had with their former horrible bosses and are setting up their own business together with their patented product the Shower Buddy. Appearing on a daytime TV show, Charlie Day is sweaty, high pitched and nervy. Sudeikis is confident, idiotic and mouthy, while Bateman is the usual straight guy trying to keep his two friends under some semblance of control. The opening scene sets the tone for the onslaught of jokes to come, mostly based around sexuality, race and gender. First they make themselves look gay, then they make themselves look racist and finally they make every hot female look like a target for a sexual conquest. The only thing that saves Horrible Bosses from being hideously offensive to everyone who isn't a straight white man is that the three straight white men at the centre of all this are the most moronic bunch of man-children you will ever meet. So when they meet with Christoph Waltz's oily businessman Bert Hanson and his slick son Rex (Chris Pine) to set up a distribution deal for their Shower Buddy enterprise, it is highly unsurprising when it all goes wrong. Horrible Bosses 2 might be saying something critical about the ruthless capitalist mindset but more than anything, it is demonstrating just how unrelentingly stupid a trio of ordinary guys can be. There are pops at the NSA and the American Dream being Made in China, but really the funnies are brought by the boys' banter, and more often than not, the sight of the three men all talking, yelling or screaming over the top of each other. Deciding to kidnap Chris Pine in order to extort money from Waltz's bigwig, the script just about manages to justify cramming in cameos from former bosses Kevin Spacey and Jennifer Aniston, giving little for the former to do but considerably beefing up Aniston's presence and amping up her wild side. Chris Pine unleashes his charisma to teeth whitening effect, bravely attempting to hold his own when up against the unstoppable silliness of Sudeikis, Day and Bateman. Horrible Bosses 2 is like its central characters; loud, obnoxious, incredibly dimwitted, but strangely loveable. There are many big laughs, even if some of the jokes get repetitive and almost every scene seems to end with the trio bellowing over each other. Bateman, Sudeikis and Day are effortlessly funny guys and the script zips along aided by some creative directing from Sean Anders. If you're not on board by the outtakes (which unless you've lost your funny bone, you probably will be), stick around in the credits to see just how much fun the cast were having while making the movie. They had a lot of laughs even if you didn't.